The brothers crouched under their queen-sized bed. They slept together because they were kids and they’d been in the house only a couple of months. Grandma had “passed on”, as everyone told them, although nobody ever told them where she’d gone. The house deep in the country was their house now. In time, their father said, they’d get beds of their own and eventually rooms too when their older sister went off to college. 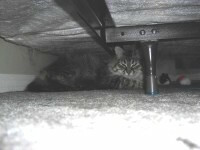 They didn’t like sleeping together although hiding out under the bed was okay. Their room had the thickest best rug in the house and grandma’s old bed left plenty of space for them to create a real clubhouse underneath. “Close the window. It’s getting too cold in here and a bat will fly in, or something,” Clark told his six-year-old brother Peter. “You do it. I’ve got my blanket,” Peter answered, clutching the tattered blue rag to his chest, as if that would keep anything warm. “This place doesn’t even have screens. Dad’ll have to cut a lot of wood in the mill to buy screens and everything else we need,” Clark complained, making no move to get out from under the bed and close the window himself. “I like the cold,” Peter stated, as if explaining why he wouldn’t leave to accomplish the simple chore. Clark sighed. His brother was impossible. At nine, Clark wasn’t more than an inch taller than his brother and certainly not nearly as thick or well muscled. The six year old was a baby version of Andre The Giant and it was disconcerting for an older brother to have to deal with. He smiled, thinking about the difference between the two of them. Clark was fast and nimble, and smart. His brother was thick, slower and six. Clark would have laughed but he was afraid his brother might figure out what he was thinking. Peter’s mind wasn’t really slow at all, although Clark preferred to think of him that way. There was a scratching from the wall of the room into which their single window was built. Both boys looked at one another in question. “What’s that, Clark?” Peter whispered, drawing his blanket closer with one hand while returning a stolen Oreo back into its cellophane package with the other. His hunger from seconds before had evaporated with the sound. Another, deeper series of scratches penetrated the silence following Peter’s unanswered question. A great thud on the floor was the next sound both boys heard. Something was in the room. Clark and Peter automatically drew together, clutching one another and staring at the side of the bed near where the sound had come from. Neither boy dared to breathe. Something was in the room with them. The early morning darkness prevented them from seeing far enough to guess what it might be, but it didn’t belong there. That much they knew. “Santa?” Peter whispered into Clark’s ear. Clark was too afraid to speak or even tell Peter not to speak. The six year old was a child. Clark had been brought into the adult world the season before when his father had taken him aside to formally inform him that there was no Santa Claus. It was part of Clark’s job to assure that his brother remained the child he was so duty bound him to silence. It was Christmas morning. Or it would be if it ever got light. Clark thought intently about Santa and the myth. The scratches had been real, however, and there was definitely something in the room with them. He prayed fervently that his dad had gotten it all wrong, and there really was a Santa Claus. They should have closed the window. They should have had screens. They should have stayed in the city where they belonged, not moved to the middle of a forest in wintertime. But if it was Santa, Clark wanted to see him. Slowly, prying himself loose from Peter while holding one finger up to his lips, he silently crawled to the overhanging blanket on the window side of the bed. He got no chance to peer out. A large animal slid under the bed from behind the opposite side. Clark winced in fear as he turned, and then threw both of his arms around his brother and kicked back toward the head of the bed at what he saw. Both boys stared into huge unblinking black eyes speckled with gold. They pressed their bodies against the back wall. There was nowhere to escape to. Neither boy made a sound, although tears of fear had begun to run down over the younger boy’s cheeks. “Don’t move,” Clark said, not knowing what else to say. The animal was a cat. Not a regular cat, but a huge cat of the forest, at least twice the size of either boy. It was dark gray in color, barely detectable in the low light. The cat’s fur was run through with small bits of leaves and tiny pieces of wood. The cat flicked its tail, as it stared at them from only a few feet away. The tail was black at its tip. It flicked slowly back and forth behind the animal, as if it was a snake’s head waiting to strike. The phrase ‘mountain lion’ came to Clark’s mind. He stared frozen in shock and fear. The three of them remained locked in place for several moments, only the boy’s breathing making any sound at all. The animal’s tail continued to move silently. Finally, the cat blinked, and then yawned. “Are you tired?” Clark whispered to the wild beast hopefully, but only got an ominous golden stare in return. “You’re scaring us,” Peter told it, making his older brother shake his head in disgust. “I’m not meat. I’m a boy. He can’t eat me if I’m a boy,” Peter whimpered out, trying to wipe away his tears with his blanket but having no luck. “I don’t know,” Clark replied, tentatively. “He hasn’t eaten us yet. He would have eaten us already, I think, if he was going to.” He let his brother go and reached for the cookie package. The cat’s great head turned minutely to track his movements. Clark took out an Oreo, put the package down, and then extended his hand out toward the creature’s muzzle. The cat looked at the cookie, then back at the boy, and then the cookie again. Clark dropped it in front of him. The cat sniffed the cookie. With one whip of a long pink tongue, the cat swept the cookie into his mouth, moved his jaw around and then returned his head to its staring position. 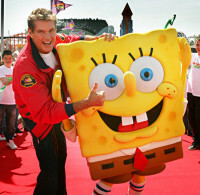 “Sponge Bob isn’t real,” Peter said, his voice weak but without a waver. “Not true,” Clark instantly said, impatiently, taking another cookie from the Oreo pack. “David Hasselhof is real, only the rest of it’s animated.” He tossed the cookie through the air. The cat quickly opened its mouth and caught the black and white wafer. It was gone in a second. “This cat’s eaten cookies before. I think he likes them. Like a game, or else he’s just really hungry,” Clark went on, tossing another cookie to the gray beast. “What are we going to do when we run out of cookies?” Peter asked, bringing his blanket up to his mouth and chewing. “What pet?” Peter asked, as Clark held up the last cookie. “Him,” Clark laughed for the first time. I think he was somebody’s pet once. He’s wearing on old ratty collar.” Clark moved slowly closer to the animals chewing muzzle. “What does that mean?” Peter asked, trying to repeat the letter sequence but not getting it right. “I don’t know. But he eats cookies, not boys, and he has a collar. Maybe he was a pet once but it looks like he’s been living on his own in the forest for a long time. “Clark reached his right hand out to touch the cat’s fur atop its head. Two great ears twitched but the cat didn’t move. It closed its eyes. “C’mon Peter, we can pet him. He likes it.” Clark stroked the animal while trying to convince his brother to join him. “I’m afraid. He’s too big, too furry, and his teeth are sharp. I’m afraid. I want mom and dad,” his brother responded, making no move to leave his place, pressed against the back wall, blanket up to his mouth. “Great idea. It’s Christmas. We always wake them up early. Let’s go,” Clark moved slowly sideways as he spoke. The cat slept, snoring mildly. Both boys crept around it, Peter dragging his blanket by it’s left paw. The blanket caught on one of the animal’s sharp claws. Peter pulled but it wouldn’t come loose. The cat didn’t move, even though he pulled several times. “He’s got my blanket Clark,” Peter complained, unwilling to let go. Clark reached around his brother and shoved backwards on the blanket, pushing it in the direction they’d come. It came free. “Gosh, it like’s my blanket too,” Peter said, as they clambered out from under the bed. Both boys ran as silently as they could to their parent’s bedroom. Opening the door, they eased into the near darkness. Clark bent over his dad, who was sleeping on his back. “Dad, dad, dad, dad,” he repeated, leaving five seconds between each word. Peter chewed on his blanket at his side. On about the twentieth “dad,” his father opened his eyes. His facial expression was not one of happiness. “It’s too early. Go back to bed until its light out. We always do Christmas when its light out. He tried to turn over. “No, dad,” Clark whispered urgently. “Not this year. 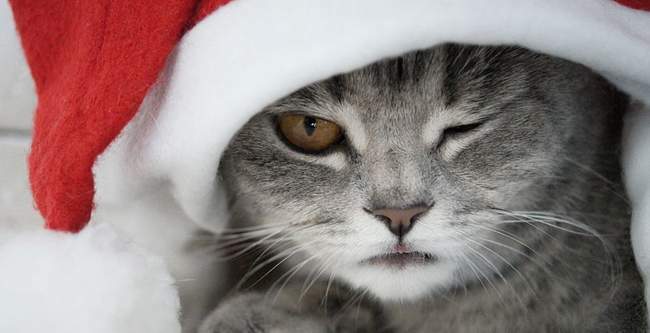 You said we could have a pet and Santa brought him. You said there’s no Santa but only Santa could have brought a special pet like this,” Clark went on. Something in the boy’s tone caught his father’s attention. He came fully awake. “No Santa Claus?” Peter asked, his blanket coming out of his mouth. “There’s no Santa, Dad?” Peter inquired, his eyes wide with disbelief. “Oh God,” his father said, sitting up and messaging his head. “C’mon Dad,” Clark said, pulling on his father right arm. They slowly moved to the boy’s bedroom, not turning on any lights. Clark led his dad into the room near the bed. “Well, where is he, this pet?” their dad asked, looking from one to the other. “He’s a cat, Dad. We’ll show you,” Clark answered, walking away. “And he’s so big,” Peter said, expanding both arms out to his sides with hands up, as he trailed after his brother. “Okay,” their father said, “but when you’re small everything appears really big,” getting out from under the warm comforter and following both boys in his pajamas. They entered the boy’s bedroom together. “He’s under the bed,” Clark pointed. “Let’s see what your this looks like,” their father said, getting on his hands and knees to peer under the bed. “Its got lettering and numbers on it,” Clark volunteered. “His name is Rabies and he’s five years old,” Peter stated, proudly.